With the SAP S/4HANA Cloud releases we constantly provide our customers a huge business advantage with the first intelligent, next-generationERP business suite in the cloud. Therefore, we have had a clear roadmap of functionalities, features and capabilities in mind. We also know how important it is to listen to our customers and to understand what they want. Despite various programs like co-innovation projects, customer surveys, hands-on partnerships, or customer request processes we now want to push this topic even further by empowering customers to speak their mind – from within the solution. SAP Customer Influence for SAP S/4HANA Cloud enables customers to not only submit ideas for improvements, features, and functionalities, but to vote on them as well. The voting results inform SAP of the product enhancements and changes customers are most interested in for future releases. Customers can choose from various SAP S/4HANA Cloud areas on SAP Customer Influence based on a line of business (e.g., Finance, Project Services) or a technology area (e.g., User Experience, Migration.) Once a customer has chosen an area, they can submit their improvement request or take a look at submitted requests to vote on them. Whenever an idea has reached a certain voting threshold it will be evaluated by SAP during a review phase. As a result, a status will be maintained. SAP Customer Influence is an open and transparent site, meaning every SAP customer can see all submitted requests and where they are coming from and vote – the power of the crowd. 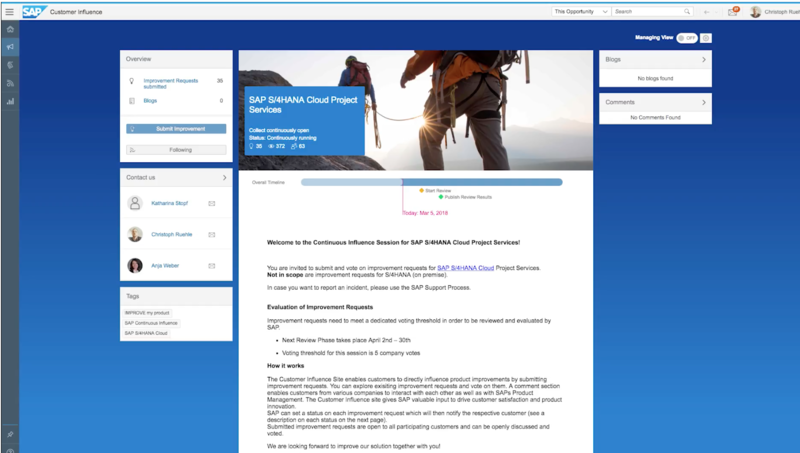 Get started by taking a look at the User Documentation or jump directly to SAP Customer Influence for SAP S/4HANA Cloud and choose your area.